Closed end lease for 2016 RLX 6 Speed Automatic with Technology Package (KC1F5GKNW) available from September 7, 2016 through October 31, 2016, to well-qualified lessees approved by Acura Financial Services. Not all lessees will qualify. Higher lease rates apply for lessees with lower credit ratings. MSRP $55,390.00 (includes destination, excludes tax, license, title, registration, $595 processing fee, options, insurance and the like). Actual net capitalized cost $41,153.76. Net capitalized cost includes $595 acquisition fee. Dealer contribution may vary and could affect actual lease payment. Total monthly payments $18,684.00. Option to purchase at lease end $27,141.10. Must take new retail delivery on vehicle from dealer stock by September 6, 2016 . Lessee responsible for maintenance, excessive wear/tear and 15¢/mile over 10,000 miles/year for vehicles with MSRP less than $30,000, and 20¢/mile over 10,000 miles/year for vehicles with MSRP of $30,000 or more. See your Acura dealer for complete details. 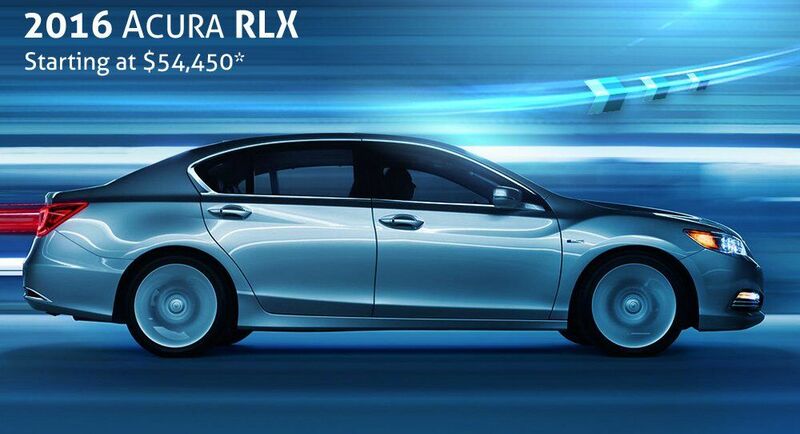 The 2016 Acura RLX luxury sedan provides style bred with power. The 310 horspower engine tied with the Percision All-Wheel Steer make the Acura flagship sedan not only exilerating to drive but it keeps the ultra luxury feel. With class leading leg room, Jew Eye LED headlights and AcuraLink this is one for the true driver. i-VTEC®engines, two advanced transmissions and two unique dynamic handling systems. The RLX is powered by a 3.5-liter, 310-horsepower V-6 engine that features Direct Gas Injection, Variable Cylinder Management™ and the Acura i-VTEC® system. The remarkable handling performance of the RLX is a result of double-wishbone front and multi-link rear suspensions. Agile Handling Assist® uses the components of the Vehicle Stability Assist™ (VSA®) system to help improve handling. While VSA® steps in to brake individual wheels to avoid oversteer or understeer, the Agile Handling Assist® uses active braking, usually on an inside wheel to help the driver smoothly and easily trace the desired line through a curve with smaller steering inputs. Variable Cylinder Management™ significantly improves highway fuel efficiency for the 2015 Acura RLX by automatically changing the V-6 engine to run on six or three cylinders, depending on driving conditions. The cylinder activation is seamless and not felt by driver or passengers. EPA Fuel Economy Ratings of 20 / 31 / 24mpg (city/highway/combined). Acura has long been at the forefront of audio and information technology. As the number of features have grown, so have the number of buttons on the center panel. The RLX designers, devised an intuitively easy way to use a touch screen with all the controls you need at any given time. The 30 buttons are now a mere nine. Resulting in one-third less istortion than the leading competitors’ flagship luxury car amplifiers, while providing substantially more power and headroom. Radley Acura is your local Acura RLX dealer. We stock a great selection of 2016 Acura RLX inventory available with great lease and APR offers. Contact our sales team today to learn more about all Acura RLX Lease and RLX Financing Offers. *†MSRP excludes tax, license, registration, vehicle options and destination charge of $940.00. Dealer prices may vary. Based on 2016 EPA mileage ratings. Use for comparison purposes only. Your actual mileage will vary, depending on how you drive and maintain your vehicle, driving conditions, battery pack age/condition (hybrid only), and other factors.